28.12.2009: Updated the code in line 38 and 41 and added “stop(true,true)” to prevent animation from looping when mouse is rapidly hovered in and out. 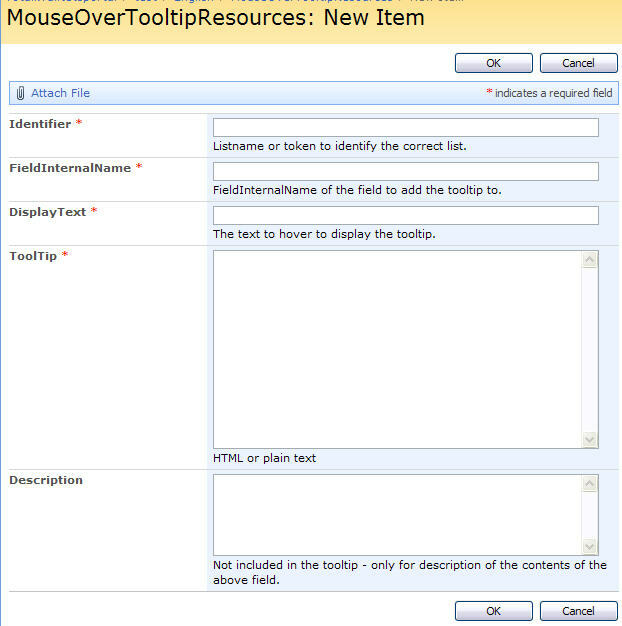 In a previous post i described how to add a custom tool-tip on mouse-over a SharePoint field. This was using the “title-property” of a DOM element and therefore limited to plain text only. It uses a standard “Custom list” as a repository for the mouse-over tool-tip’s. This list can be used for multiple lists. 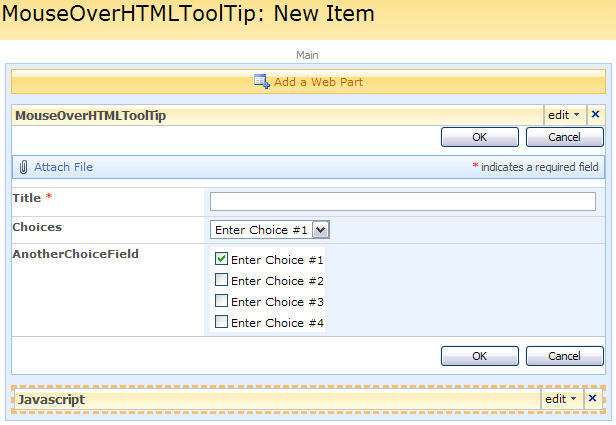 The sourcecode for “HTML_style_ToolTip.js” is provided below. Save this as “HTML_style_ToolTip.js” and upload to your scriptlibrary as shown above. I am playing with this and I am not sure what I am missing. I am getting the alert from line 52. In the source list. where you have “MyTestList”, this is the Identifier, correct? also which field did you orename from Title, (Identifier or FieldInternalName)? Here is a neat find, for displaytext I added an image tag and the image displayed. [img src=”/_layouts/images/HELPICON.GIF”]. very kool! This gives me the position I want, but I lose the tooltip. Any suggestions? That moves it, I was able to achieve this also, but the tooltip does not display. I think my issue is I am using your narrow script with this one. So I believe that the class ms-formlabel is hidden. I can move my text/image to the left or the top and the tip works. but when I move it to the left and top I lose it. Edit line 32’s style attribute “float” to “float:left”. 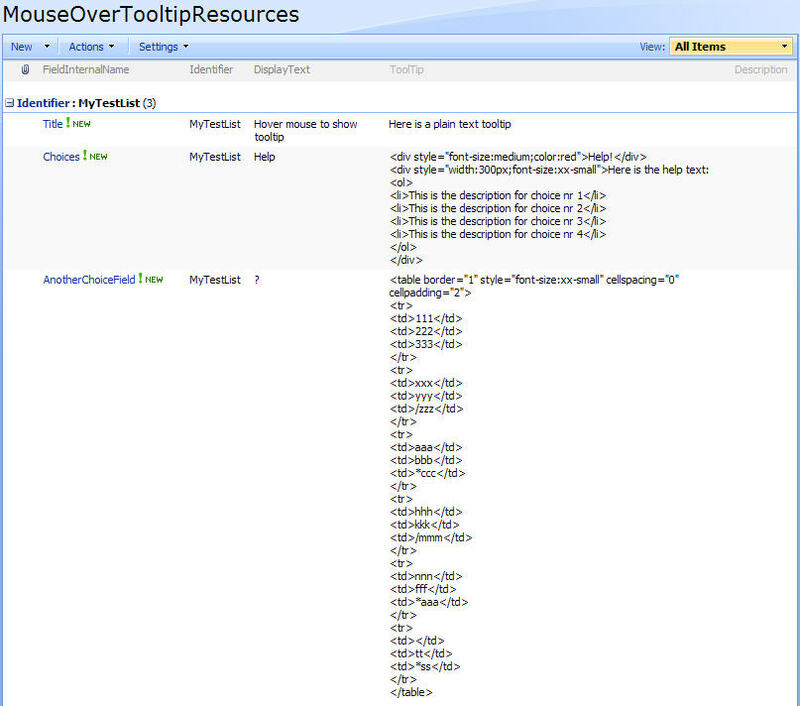 Call the tool-tip-script after the “narrow to one column-script” and you are good to go. Now I am going to bug you again. I am trying to make the corners rounded. I am linking to the jquery.corner.js file but I am not sure what or where to apply. I had never tested this plugin, but was actually very simple. This looks like it could be another really useful tip. I got the title-property method working but have been having difficulties with this one. I keep getting the ‘contact administrator message’ from step 52. I doesn’t seem to be picking up the identifier. I tried redoing with renaming title to FieldInternalName as Larry suggested but still have same error message. Have also tried changing toolTip(‘MyTestList’,’MouseOverTooltipResources’) to toolTip(‘MyTestList’,’/listpath/MouseOverTooltipResources’) but still doesn’t work. Also – for the field type of the tooltip – does the number of lines for ‘multiple lines of text’ matter? I have left at 6 and just been focusing on getting the basic text line tooltip to work first. Sorry for not replying, but i have been in bed with the flu for the past week. The ‘MyTestList’ is only a identifier to find the correct items (mouseOverText) for the current list (if you use the same repository for multiple lists you do not have to think about the FieldInternalNames beeing unique). The ‘MouseOverTooltipResources’ is the DisplayName of the list where the mouseOverText is placed (you could use the GUID, but this being a “technical” list no one should go about editing the list’s DisplayName and therefore it may be easier to use). The error in line 52 basically says “there is something wrong with your query” – it may be a FieldInternalName that is wrong in the list that you are querying – check the names referred in the function “init_tooltip” agains the FieldInternalNames of your list. Thanks for the post.Its working good for default Share point Forms.Do u know how to do Tool tips for Form Field Custom Webparts through code behind? I’m not sure if this has anything to do with your question, but take a look here How to use these scripts in a customized form, for information on using my scripts in a modified form. I have my lists setup but I am having no luck at all the scripts load but I don’t get anything I am querying. Any suggestions will be greatly appreciated. My Chinese is a bit rusty. Any chance you have the “interaction.js” and “stringBuffer.js” scripts in English? Thanks man! Nevermind I found it here: http://spjslib.codeplex.com/releases/view/22639 I don’t know if you need to update your links or if it was just me. am tring to use this solution. But am stuck! i want to provide a tool tip for user who creates a NEW item in the list. when the user is navigated to the page where he creates the NEW list item, he should be able to see the tool tips each of the fields. i hope this soution of your’s works for me. you specify to add a new CEWP. but where should i add it? Pls give some description on this. specifically “Add a CEWP below your NewForm and EditForm list-form (and DispForm if you like)” . where do i have to do this? pls help! You find a description on how to do this. that helped! but some more questions!! where can i get interaction.js and stringBuffer.js? This is listed in this post just above. thanks for the qucik response. I have already downloaded those files. but am seeing all the junk charecters in the doc. actually when u click on the link specifed for the for interaction.js and stringBuffer.js it takes you to a page where there is a download link. but if you directly click on that dowload, you will be downloading the documentation. I am little confused with the input parameters. Am using a Calender list. So for this i guess the ListnameOrToken is the name of my calender and i tried searching the Guid for the calender, but didn’t find one. “List name or token” can be any value you like, as long as it is the same in the function call as it is in the “tool tip repository”. It is used to find the right values from the repository. No changes are to be made in the file “HTML_style_ToolTip.js”. I put a alert inside this block and it is never popping up. can you please help me put here? Is the form a standard – unmodified SharePoint form? Am trying to reply to that above, but it’s not working. Please let me know what i am missing or doing wrong. I asked you in another comment if the form is modified in SharePoint Designer. Is it? By form you mean list right? If so, then I have NOT modified anything in SharePoint Designer. I created a custom list in SharePoint and use it as is. It “checks” the Tile field and should return “object”. If not there is something wrong with the init_fields function. The CEWP is placed below the form in NewForm, DispForm or EditForm? First off, thanks very much for helping me out! And now am able to see the the tooltip. But i still have a small issue 🙂 . When i hover over the Help and ?, it displays the html code as is without rendering them. Any help here would be great! Hello, i am also having an issue with HTML rendering. The tooltip shows but the HTML tags do so as well. Any help with this would be appreciated. What kind of multiline text-field do you have for the “ToolTip”? if it is not plain text, try to change it . Just want to share the issues i faced and the solutions to them, so that others don’t have a reference for similar issues. You get the above error when u try to execute the script and you have not created a list (repository) from where the tooltip text will be picked. *If you have a field named ‘Title’ (or any other field), then search for it. Is it possible to have tooltips per column directly into the list view…??? The problem starts with the fact that users scrolls down and the column headers disapear. Microsoft should have thought of a way for the column header row to free like in Excel. We have try in on are site but the we have add more field in the list for that page and the function seen to to graps more thatn one fields. We are also looking for the internal field name to seen if this is the problem we are facing. Got it working, great tool! How can I adjust the size of the Help window to be bigger? It pops up a window but put one word per line…is it possible to change? This is up there with one of my favorites scripts you have created. It is a fabulous script. When the popup is large I have found some users fumble trying to read all the text. Because it is a hover, if they dont directly right to the popup it fades. I thought about converting the hover to a click. The problem I ran into now is it doesn’t go away. What would line 37 change to to make this a click to show and click to hide? Still having trouble? – i missed out on this question. No worries I know you are busy. I did not solve this one. As you read I can get it to click and show, but I can’t get it to hide. when you get a minute any help would be appreciated. Do you have any Idea where to look? Sorry for the late reply. Do you still have trouble? And my TestCustomList is exaclty what I have in my repository’s Identifier column. I’m pretty sure I have everything setup correctly. I have all four filles referenced correctly. My two variables of ‘TestCustomList’ and ‘MouseOverHTMLToolTips’ match my identifier field and repository name. I’m thinking the error lies within the code quering the repository list. Nothing I try seems to help. Hi, Send me some screenshots of the various lists and I will take a look. Having same issue. I did some checking and res.count is coming back as “-1”. this method doesn’t apply on survey fieldsquestions. Any help on this? In line 32, replace “td.ms-formbody” with “td.ms-formbodysurvey”. So I am trying to get this configured, but I am literally getting nothing. No error, no tooltip, just nothing. It almost feels like the jscript isnt running at all. I put a CEWP into my newform.aspx, and added the correct script, but I did it with the designer – does that make a difference? Its also a slightly customized form. I tried hiding my custom form and reenabling the standard form, but nothing changed. I have a custom list “MouseOverTooltipResources” both in the project and in the root of the sharepoint site because i wasnt sure which location to put it. My list is comprised of multiple words, so when I put it into the Identifier field, should I be putting it in quotes? Any thoughts on what I am missing would be appreciated. This post is a bit dated and will not work in other than IE. I guess your problem is the customized form. This solution (and all the other solutions in this blog) are made for uncustomized forms. Most times I google for some hint or help Alex has already done it. Thanks a lot you are awesome. I cannot get this to work. I added an alert and see “undefined” which I am assuming is conflicting with your spjs-utility.js file as I am using your “Dynamic Forms”. Any chance of you updating this to work with that? This one is old and not compatible with newer browsers / jQuery. I’ll see if i can whip up another solution like that works for all browsers. Will this work for field values in a Standard View of a list? minimize it. In order to satisfy the requirements of various investors there are different kinds of funds available in the market. Basically, you take your cash, swap it into gold, saving it later on years of life.